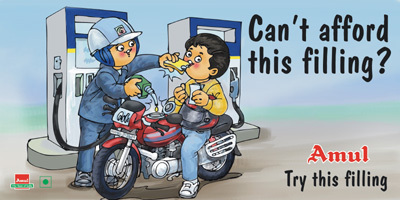 Take a drive down any road in a major metro in India and you will come across large billboards with bright colorful cartoons featuring a wide -eyed little girl and witty tag line or pun sure to bring a chuckle or smile. These are the famous Amul ads – meant to sell plain ol butter (under the brand name Amul)….but the ads themselves have become a cultural phenomenon that is now more than 30 years old! There’s even a facebook page dedicated to the amul ads and at the time this post was published, it was at 68K fans! Check it out at here. 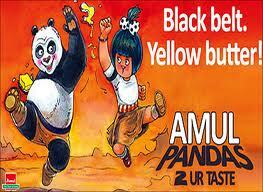 Utterly butterly delicious – Amul!